This means that we win both in space and time since our location is not important plus we gain a lot of time. 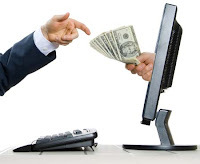 In this post we will try to introduce some online ways to have income. The list is interesting to be taken in consideration. We have tried to dodge some spam ways which tries to delusion people by making online income as quite easy task and such. It should be already clear that winning money is nowhere so extremely easy to win in such a way that these spammers try to engulf other people to believe. Freelancing has been made one of the most prospecting way of winning money online. In Freelancing you are a self-employed person who sells the services with no commitment to any employer by long term. You can offer your services in wide wariety of fields like: music, IT, publishing, web or graphic design, consulting, translating etc etc. Fivver is one of the most popular website where you can offer small services for $5. It is widely popular and you can either offer or find services in wide varierity of fields. You probably might want to attempt doing online surveys from house to make some extra cash while trying new products. There are hundreds of companies that enlist research panels of average consumers to complete surveys online. You shouldn't expect to gain a full salary from taking online surveys, but it is possible to earn $50 to $100 a month in cash and free products if you take several short surveys, according to experienced online survey site members. The key is to sign up with several survey sites (which are all free to join) to increase your chances of being selected for the surveys. When you join a survey site, you provide your personal information, which credible survey sites will not disclose to any other party. That information is used to pick participants for surveys on specific products and services. When you are selected as a panel member, you will receive an e-mail inviting you to take a short screening survey to determine if you fit the profile for that particular survey. If you qualify, you will be asked to take a longer online survey in exchange for some sort of compensation. Google Adsense is a program that allows blogger/website owners to put an image, or interactive media adverts that target site content and the audience. The adverts are administered by Google and money can be generated either by per-click or per-impression. Google target ads depending on the content of your website or blogger. In order to get Google Ads in your website you need to apply for it. After you apply Google checks whether you are eligible for their program or not. They ask for the content on your website to be unique, and your blogger/website needs to have already considerable number of articles. Google Adsense is definitely one of the most paid internet ads. In comparison with Google Adsense which targets with interactive media adverts or images Infolinks is a text advertising ad that has the pay per click system. Infolinks is the best alternative in the Internet right after Google Adsense. It fits the requirements for those who might find it hard to get Google Adsense or they don't have enough space in their blog to display adverts. If you are good enough on Programming be it Desktop Programming or Web Development there is various ways you can find potential jobs online to build applications for either a person or a company. TaskRabbit is a innovative website or better say a online market where the employer can put the task that he needs to be finished and the employee puts his own CV ( video interview). The employee usually needs to live near the employer so he can finish the task. TaskRabbit is not exactly a strict online way of money but it still fits the qualification because it's a quite interesting marketplace for people to find small tasks. As i already said on the beginning, there is no easy way of winning money through online ways. Everyone who promotes any tool by magically acquiring moneys is probably a spammer. But, if you are a hardworker and you are armed with couple of skills then you should try your luck.